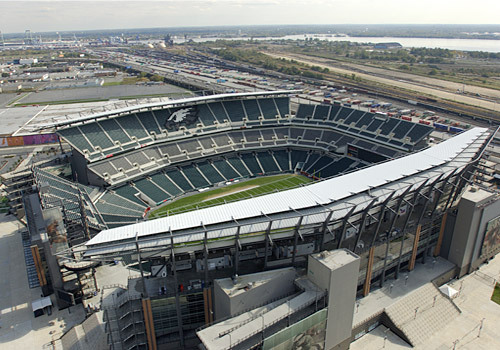 Ground was broken on the sadium on May 7, 2001 and completed just two years later in time for the Eagles to play their first game there on August 3, 2003. Their old home field stadium, Veterans Stadium, featured roughly the same seating capacity, however, the new stadium has double the number of luxury and wheelchair-accessible seating. In addition to serving as the home of the Philadelphia Eagles, it’s also the home of nearby Temple University’s Owls football team. It’s the primary home of College Football’s Annual Army-Navy Football Game, which sometimes plays in other cities, but is most often featured at Lincoln Financial Field. It’s also been the sit of the NCAA Men’s Lacrosse Championship game in 2005, 2006, and again in 2013. It is considered the “Greenest” NFL Stadium to date with its energy efficiency and efforts towards reducing energy usage throughout the stadium, including the use of 14 wind turbines outside and on top of the venue. • The first game at the stadium was an international Professional Soccer match between Manchester United and FC Barcelona on August 3, 2003 to open the stadium. • The Eagles played their opening game there as a preseason match-up with the New England Patriots on August 22, 2003. • The site of the infamous “The Miracle of 4th and 26th” play on January 11, 2004 when quarterback Donovan McNabb threw a 28-yard completion to receiver Freddie Mitchell to convert the crucial 4th and 26 on their final drive of the game. They went on to make the game tying score pushing the game to overtime where they advanced on a David Aker’s field goal. • In the NFC Championship game on January 11, 2004, the week after “The Miracle of 4th and 26th” play, the Eagles lost their 3rd straight NFC Title Game.